The RDS SAM 200 allows for more accurate fieldwork and the acquisition of information relevant to invoice charging. More accurate fieldwork saving resources and enabling the accurate acquisition of information relevant to invoice charging. Engine hours can relate to ignition hours or true engine hours as required. 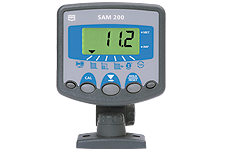 RPM measurement is optional and can be taken from any shaft, typically the PTO. Instantaneous Work Rate (ha/hr or acres/hr) and engine hours.